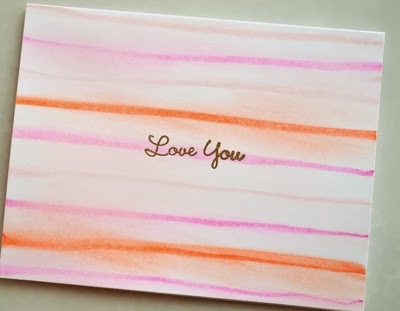 Made by embossing a sentiment in gold and then drawing Gelatos over the card and swiping the stripes with a baby wipe. Easy, fast, interesting. This was an experiment. Why not? And welcome back to so many long time readers who found me again. That's nice! ooh, I like this! thanks for experimenting and sharing with us! This is a great effect with the gelatos; thanks for sharing the inspiration. I just got gelatos last week; great way to make a first step in using them. Thanks for the idea! This technique looks really cool! Gosh, I got baby wipes so I could do this sort of thing, and they dried up before I'd tried them more than a couple of times. That was years ago. I'm not good with techniques. You've got the simplicity down pat and you had the fun of making your own design. Nice! Love this! You are so clever! Yay! I found you! And here I was, feeling vaguely like some sort of stamping stalker, googling your name to see if you'd started blogging again. I hope that puts me in the "fan" camp, and not the "creepy" camp! Either way, I'm glad to see your blog here, and enjoying the posts, as always.